Add photos and a great description. 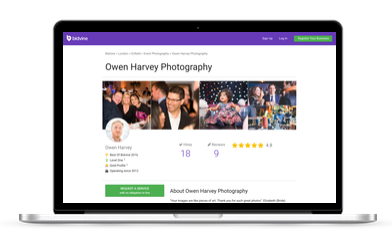 Investing time in making a great profile is key to winning new business on Bidvine. Customers look for professionals with complete profiles that include images, reviews, and clear and professional messaging. We love the beauty in simplicity. Use clear and professional communication and make your description of what you do and what you value as simple, transparent, informative - and really let the tone and values of how you do business shine through. You should have content for all if not most of the optional fields in the service profile editor. If you don't have certain social media profiles then use this as an incentive to go set up accounts. If you don't have a logo, then let us know and we'll point you in the right direction to get one. There are many high quality and cost effective options. If you need photos taken for your business then there are lots of photographers on Bidvine ready to help. If you need help adding or editing content just let us know. Your profile isn't just getting it done and adding content to as many sections as possible. Take the time to think about the content you are adding to your profile. If it's not your best work, then you can't expect to win more work. Add a logo to your profile. If you are a business without a logo then add an image of your business name in text. If you are a sole trader without a logo then add a picture of yourself. Add portfolio images to give a visual insight into you, your company and your work. Show the cleanliness of your job sites, include a team photo, show well-labelled before and after shots, include pictures of you in action showing how you deliver your service and your interaction style. Every service can show the people, the process and the outcomes of the service they deliver - and we know everyone loves to read AND see. If you want any help adding or editing content, get in touch with us.